Anelletti al Forno. 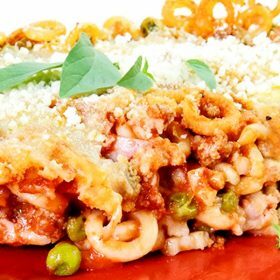 From the city of Trapani in Sicily comes this delicious baked pasta dish, similar to a Baked Ziti, but with a smaller pasta shape. I switched out the usual meat sauce of pork and beef and used ground turkey, which is lighter and perfect for the hotter days of Summer. I sent Nonna the recipe to try…She made it, she ate it and gives it her stamp of approval! In a large pot heat the olive oil over medium heat and add the the onion and peas. Cook, stirring occasionally, until the onion becomes soft and translucent about 10 minutes. Add the crushed San Marzano tomatoes, season with salt and pepper to taste. Simmer the sauce over low heat, covered for 15 minutes. While the tomato sauce is cooking, heat 2 tablespoons of olive oil in a large skillet over medium-high heat. Add the ground tukery, thyme and season with 1 teaspoon salt and 1 teaspoon of pepper. Break up the meat with a wooden spoon into very small pieces, and cook until it becomes slightly brown in color, about 7 minutes. Add the meat to the sauce. Simmer the sauce, covered, over very low heat, for 30 minutes, making sure that the sauce doesn’t get too thick. Season with salt and pepper to taste. Set aside. In a large pot, bring to a boil 6 quarts of salted water. Add the anelletti and cook for about 6 minutes, (you will be cooking the pasta again in the oven). Return pasta to the pot and mix in 2 cups of sauce and the diced ham. Into a greased 13 by 9-inch baking dish, pour half of the pasta with the sauce and sprinkle 1/2 cup of mozzarella and 4 tablespoons of Parmigiano-Reggiano. Add 4 generous ladles of sauce. Pour the rest of the pasta on top and sprinkle with the rest of the mozzarella and Parmigiano and meat sauce. Bake in the oven for 40 minutes at 350º or until bubbling and the top turns golden. Remove from oven and sprinkle the reserved Parmigiano on top.